“Like what?” questioned John Connor. “Knives and stabbing weapons,” answered the T-800, who was played by Arnold Schwarzenegger, in 1991’s Terminator 2: Judgment Day. 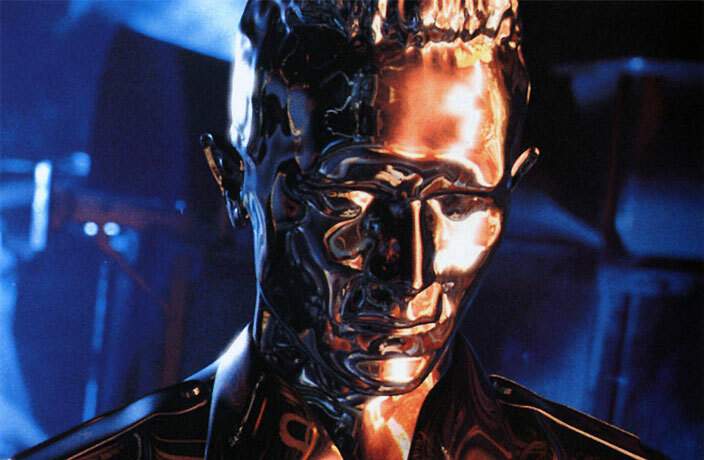 It was one of the most chilling lines in the whole movie and was made in reference to the ‘liquid-metal’ T-1000, the film’s time-traveling robotic villain. The liquid metal is comprised mainly of gallium, a soft, silvery element that becomes a liquid at temperatures above 29.8 degrees Celsius. (Also used in the liquid metal: tin and indium, according to New Scientist magazine). While the small device is far less intimidating than the menacing T-1000, the scientists behind its development were motivated by T2’s antagonist. Video footage of the liquid-metal motor shows a drop of silver liquid being ‘fed’ a flake of aluminum, which then fuses with the shiny droplet – causing it to rotate. The small metal orb can then move entirely on its own, or work as a self-powered pump. The robot’s development was a joint project between Li and Zhang Shiwu from the University of Science and Technology of China, along with researchers from the University of Wollongong, which is located in the Australian state of New South Wales. In the future, the team hopes liquid metal robots can be used to aid in search and rescue missions, as well as medical procedures. “We expect to further develop soft robots incorporating liquid metal that could be used in special missions such as searching for and rescuing earthquake victims, since they can change shape to slide under doors or make it through spaces humans can’t get into,” said Tang, according to SCMP. The robots can deliver up to 25 kilograms of food in one run while also being able to work for 12 hours in a roll on one charge. Innovation can be learned, and your child can begin early with these awesome robot kits! When charged, it can also move eyes, lips, arms and upper body independently.